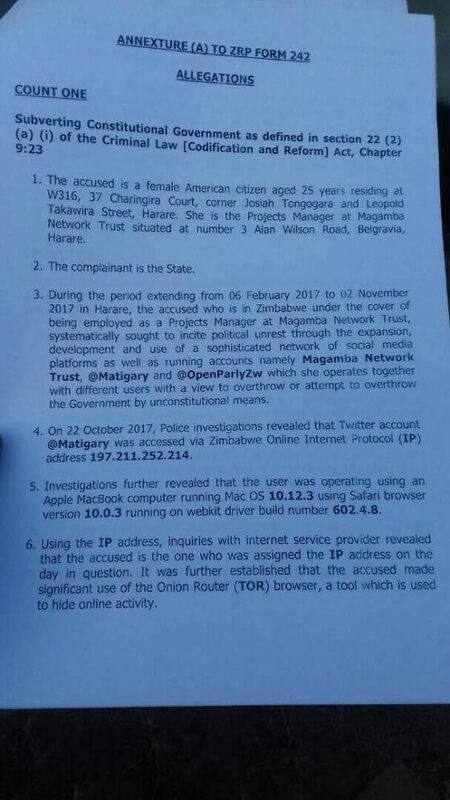 A few days ago, a woman called Martha O’Donovan, who works for a local activist organisation called Magamba Network, was arrested by the Zimbabwean government on the charge of undermining the authority of the president with a tweet. Yes, a tweet, which you can read about here. There have been some further developments since. Today, a charge sheet emerged on Twitter detailing her alleged crime. The government is laying two charges. 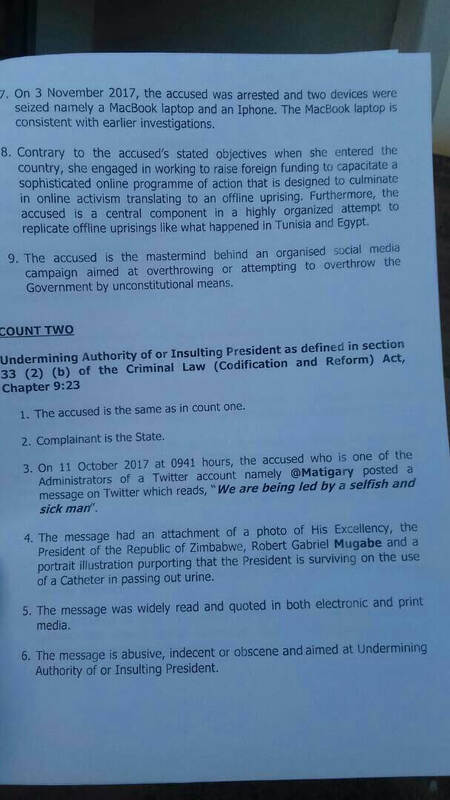 Subverting a constitutional government through Masterminding a social media campaign to overthrow the government by unconstitutional means, with the campaign allegedly being run under the social media accounts; @Matigary, @OpenparlyZim and Magamba Network Trust. Undermining the authority of and insulting the authority of the president by tweeting as @Matigary a tweet that read “We’re being led by a selfish and sick man”. There a few things to note about the details in the charge sheet. The first is that police have investigating @Matigary and their apparent break came on 22 October when they found out the account is run by a ZOL customer on IP address 197.211.252.224. The charge sheet does not say how they found this out. It makes it clear however that the police then approached ZOL and the ISP handed over the identity of O’Donovan who they said had been using the IP address at the time that the @Matigary account was accessed by the IP. ZOL is Zimbabwe’s largest ISP and is owned by Liquid Telecom and Econet Wireless Zimbabwe. The second noteworthy thing is the seriousness of the charge. Apparently, for posting stuff on social media, and in this case the “sick man” retweet, O’Donovan was masterminding an Arab Spring-type revolution. Really, without any more detail from the police on how they got to these conclusions, it’s hard to make sense of any of this right now. It just doesn’t make sense a retweet (or even a tweet) equals an attempt to overthrow a government. What is certain though is that the Zimbabwean government has started the dreaded crackdown on social media and is not going to wait for its Cybercrime and Cybersecurity Bill to become law. It’s not clear if this is the government’s new Cybersecurity ministry that’s already at work or an initiative by a different government agency. O’Donovan has been remanded in custody, the Chikurubi Maximum prison, until 15th November. Lawyers representing her have said that they’ll be applying for bail at the high court on Monday, 6 November 2017. 1) Requesting it from Twitter which is unlikely in this case as the Zimbabwean government does not have the juice to force Twitter to comply. 2) Using a specially crafted link which was laid for the user as a trap for example someone tweets to @matigary with a juicy link which @matigary follows. This link is on a domain and server controlled by the government or government agent/actor. This is far more likely and in line with the information presented here. There is another possibility. The government goes to ZOL asks for the defendant’s IP address on a given date and frame her with zero evidence both cases are too ambitious and unlikely to succeed. This is also is possible considering the account in question has not stopped tweeting. The goal here seems to be to frustrate the defendant using remand prison and eventually dispose of her via deportation.It is also possible this is a group controlled account which is run by several people with access. Desperation by a regime in which the majority no longer have faith in. Let’s see if these puerile charges will stick in a court of law.